The 2012 Zane Grey Invitational, the first tournament in the California Billfish Series presented by COSTA kicked off with eight boats fishing for more than $60,000 in cash. 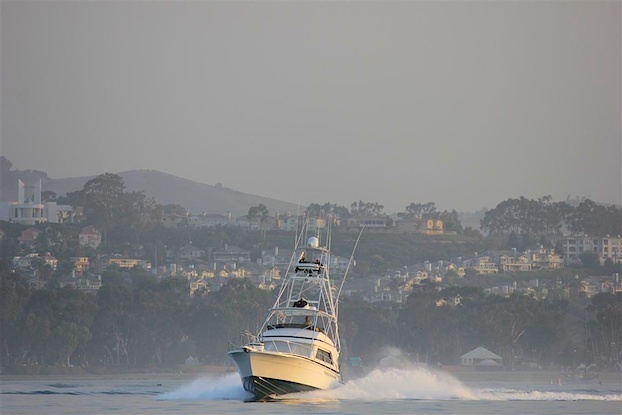 The fleet left the harbor in Dana Point, California, with lines in at 7 a.m. and headed out to the fishing grounds. Crews had high hopes as the Southern California striped marlin bite has shown a huge improvement over the last couple of years. Chiqelin, a 54-foot Bertram run by Capt. Mike “Beak” Hurt called in to Tournament Control just before 10 a.m. with the first hook up of the 2012 California Billfish Series. Angler Rich Raffieny was tight to a striped marlin and in less than 40 minutes the crew had an official release to take the lead in the Zane Grey Invitational. It didn’t take long after Chiqelin’s fish for the next boat to come tight to a marlin. The crew on Chaser, a 54-foot Viking led by Capt. Jimmy Kingsmill hooked up at 10:51 a.m. near the Pyramid Head in tournament grid C5. Angler Barry Brightenburg hooked the fish on a live bait, and got the official release at 11:35 to tie with Chiqelin, both with one release each. Angler Greg Chase hooked another fish for the Chaser just minutes before Lines Out, the official stop-fishing time for the tournament. He hooked the fish on a bait, again in tournament grid C5. Unfortunately, the striped marlin came unbuttoned after an acrobatic fight, and they did not register the catch, but it did make for some exciting fishing. The day ended with two marlin released and one hooked and lost. The fleet is fishing again today and with such a close leaderboard, the prize money is still within reach for the entire fleet. The Zane Grey Invitational is a modified-release tournament, so one big fish can change the outcome in a hurry. To keep up with all of the action, follow the live scoring on the California Billfish Series website by clicking HERE. The California Billfish Series presented by COSTA is the largest offshore tournament series on the West Coast. The series is made up of three tournaments, including the Zane Grey Invitational, Avalon Billfish Classic and the Catalina Classic. These three tournaments are the premiere events in Southern California is owned and operated by www.BDoutdoors.com and sponsored by some of the top companies in the sportfishing industry including: COSTA, Hot Can, Salt Life, Grundens, Melton Int’l Tackle, Rancho Leonero Resort, Berkley, PENN, Fisherman’s Landing Tackle Shop, Dana Landing, Bub’s Dive Bar, Pakula Tackle, Fish Dope, Montauk Tackle Co., Anglers Center, Pacific Coast Sportfishing Magazine, Phenix Rods, Accurate Fishing Products, Mustad, Fraser Optics, Waterman’s Applied Science, Bubba Blade, Salty Dawg Custom Rods, Batson Enterprises, Rotations Pet Food, and Happy Ending Lures. For more information on the California Billfish Series, visit www.CatalinaClassic.com.